Though it's a bit cheaper than its rivals, the Trion slows to hard drive speeds when writing even mildly large amounts of data. 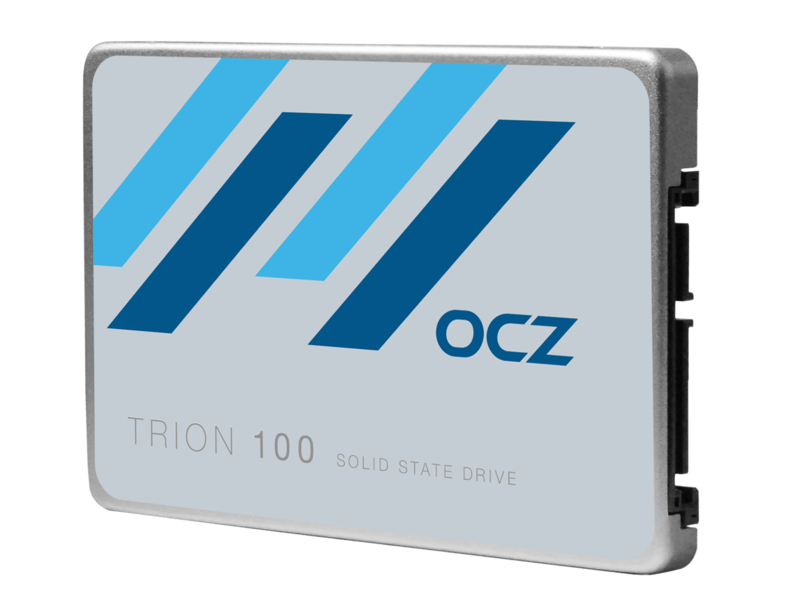 OCZ’s new Trion SATA 6Mbps SSD is the NAND equivalent of a combo drive: It uses slow but dense 19nm TLC (Triple Level Cell) for the majority of its storage, and a cache of much faster SLC NAND to increase performance. It’s not the only drive on the market that uses the fast/slower NAND model, but in the Trion’s case, the TLC is slow, and there’s not nearly enough SLC cache to maintain performance during even modestly large file transfers. Especially in the lower-capacity models. Note that this is the first pure Toshiba product marketed under the acquired OCZ brand name, a company with an excellent reputation for performance. 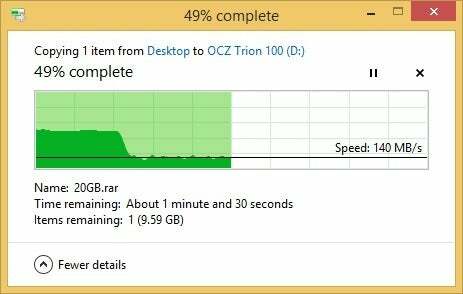 I feel for OCZ. Other drives that use the faster cache/slower-NAND model generally offer relatively large 32GB or 64GB caches, so you’ll hardly ever notice a real slowdown. However, the cache on the 120GB and 240GB Trions is a measly 3GB, and even the 960GB model’s reservoir is a smallish 15GB. I have movie files larger than that. As you can see from the Windows 8.1 copy graph, the Trion’s speed dips precipitously when the amount of data being copied exceeds the size of its small SLC cache. In my tests with the 480GB Trion and its 7GB cache (using a fast-as-main-memory RAM disk on the other side), it took 2 minutes and 25 seconds to write the single 20GB RAR file, and two minutes, 49 seconds to write a 20GB mix of smaller files and folders. That’s a paltry 137MBps and 118MBps respectively—not what I want when I’m backing up large amounts of data. I didn’t have the opportunity to test the other capacities, but my chat with an OCZ product manager confirmed that the same drop-off will occur the minute the SLC cache fills on any Trion. I also ran AS SSD, CrystalDiskMark 3.04, and CrystalDiskMark 4.1. 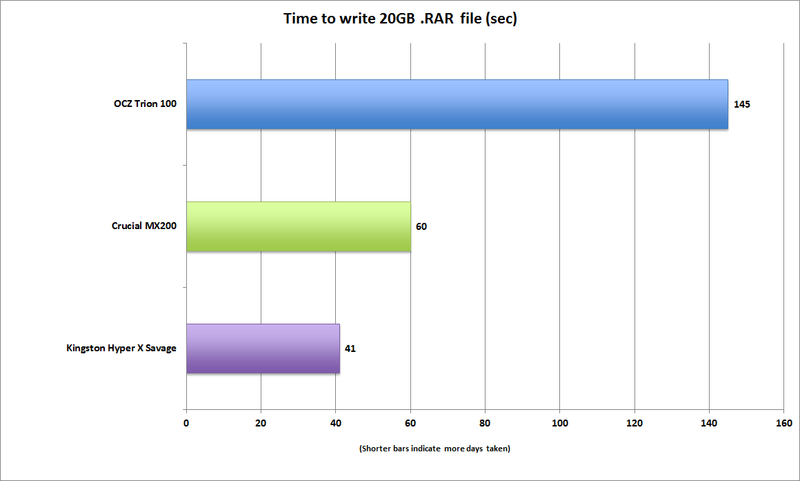 AS SSD rated the Trion at 512MBps while reading and 479MBps reading during its 1GB test—quite good. When I upped that to 10GB, the read speed remained decent at 464MBps, but the write speed dropped to a hard drive-like 161MBps. CrystalDiskMark 4.1 showed a similar pattern, but not to the same degree. CrystaldiskMark 3.x doesn’t write enough data to reveal the phenomenon. While the large-file performance drop-off is a serious issue, you’re only going to take the performance hit once in a while unless you’re constantly writing larger amounts of data. Most of the time the Trion will perform quite nicely booting, during normal Windows operation, surfing, streaming, etc. 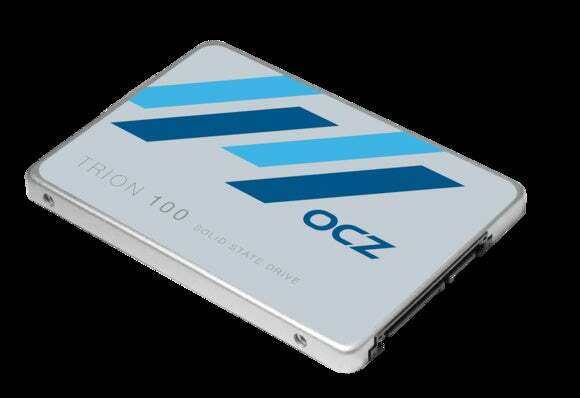 The OCZ Trion’s limitations become very apparent in file writes that exceed its cache. There’s a bit of a mystery surrounding the controller in the Toshiba--err--excuse me, OCZ Trion. It’s new, and Toshiba claims the controller as its own. Toshiba has partnered with other companies for controllers, but so do other SSD vendors, and they’re equally as obstinate in calling them their own. Kind of like famous people writing their “autobiographies.” Sure. Whatever the case, it’s impossible to judge its efficiency because of the issues when transferring large blocks of data. A Toshiba drive being marketed under the acquired OCZ brand name, the Trion 100 is a decidedly unspectacular performer with large data sets. The Trion does come in pretty darn cheap: $57 for the 120GB model, $88 for the 240GB, $185 for the 480GB version, and only $370 for the 960GB drive. A few of months ago, that might have wrung another half-star out of me in spite of the performance bottleneck. But worthy bargain drives from Crucial, Kingston, Samsung, Sandisk, and even OCZ have dropped to near or below 40 cents per gigabyte. 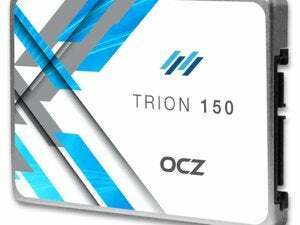 OCZ backs the Trion with a modest three-year warranty and TBW ratings of 30TBW (120GB), 60TBW (240GB), 120TBW (480GB), and 240TBW for the 960GB model. That’s about par for bargain SSDs. TLC hasn’t been on the market that long, so there are still some trust issues, but I don’t think longevity will be a problem for anyone who reads this review because I simply can’t recommend the Trion. I’ve seen some pretty decent ratings for the Trion in other reviews, but if I bought it, then watched it settle down at 150MBps while I was copying a movie file, I’d be pretty upset. Especially knowing that I passed up much better drives in the same price range.